Biology graduate student George Jarvis presented results from his Master’s thesis research in the lab of Mark Steele earlier this month at the annual symposium of the American Academy of Underwater Sciences, held in Tahoe City. Jarvis’s presentation, “Evaluating the Effects of Predation Risk on Prey Reproduction in aTemperate Reef Fish,” presented results from a field experiment in which bluebanded gobies were provided with artificial habitats with varying levels of protection from predators. 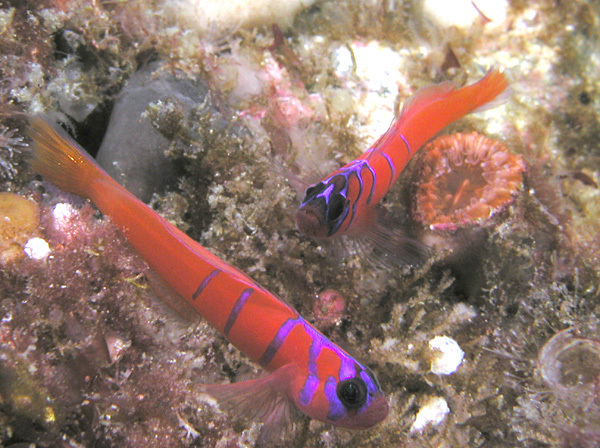 Gobies experiencing more predation spent more time hidden, and laid fewer eggs than those in protected habitats, though there was no difference in their survival to the end of the experiment. This suggests that just the risk of predation exerts a cost on these reef fish.